Massachusetts isn’t just flirting coyly over the top of its fan with Spring this year. This year Massachusetts is conducting an indiscreet rambunctious affair with Spring the likes of which haven’t been seen since Charles II took up with Nell Gwyn. I didn’t know this was going to be true when I picked March 23rd for a day at the spa with my roommate, followed by treating ourselves to dinner at 80 Thoreau, but it worked out very nicely as I moseyed down Newbury Street on Friday afternoon in a sundress (and daringly, no stockings!). The day spa was the kind of decadent that I need to remember to treat myself to more often. Not only did the massage leave me practically comatose, but afterwards I got to lounge in the sun on their roof deck in a fluffy bathrobe talking to my roommate about books and sipping an espresso. Then we wandered our way down Newbury Street, stopping in the Boston Olive Oil Company to sample the variety of olive oils and balsamic vinegars they had on offer. I left with a bottle of Espresso Balsamic Vinegar, which isn’t a flavor I would ever have thought would work, but is phenomenal. I plan to simmer it down just a tad until it’s syrupy and then drizzle it over good vanilla ice cream and berries for dessert after Easter Dinner. We actually spent a little longer lounging in the sun and window shopping down Newbury Street than we should have, and were a little rushed getting home, changing, and getting back out the door to make our 7:30pm reservation at 80 Thoreau. However, we made it exactly on time and were whisked to our seats near the open kitchen where we could periodically peer at the organized chaos appreciatively (this is when we weren’t unsubtly checking out the food at the next table as we tried to figure out what we wanted to order). 80 Thoreau is a restaurant that opened about two years ago out in Concord to what is I think one of the most adulatory reviews I have ever seen the Boston Globe give a restaurant, particularly a new restaurant. It’s somewhere that I periodically window eat at, by which I mean I pull up their menu online and stare at it hungrily, but have never actually gotten around to actually going to. However, we picked March 23rd for our day of indulgence for a reason and part of that was because it was during Restaurant Week. Boston, like many major US cities, does something called Restaurant Week twice a year during which time a lot of/most of the high end expensive area restaurants will offer a three course prix fixe menu for $33.12. I always mean to take advantage of Restaurant Week, but by the time it rolls around and I get organized everyone else has had the same idea and everywhere is booked solid. This year I marked it on my calendar in advance, and planned my day off around ending with a luxurious dinner a month in advance. My roommate and I took the divide and conquer approach to the menu – by which I mean we each ordered different things so that we could sample as much as possible. She started with the mushroom soup, scented with tarragon and vermouth. I started with the citrus salad with almonds, arugula and gouda. It was lovely and paired well with my main course, but the soup was better. My roommate continued her meal with Roasted Pork Loin, served over a bed of braised cabbage and flageolet beans. The pork achieved something I’ve never come across before in a pork dish – it tasted like pork, as in the pork had actual intrinsic flavor of its own that didn’t come from a sauce or a brine. I’m not sure if it was a function of the quality of the meat, or some magic they performed on it in the kitchen, but it was remarkable. I stuck with my New Year’s resolution to be more adventurous about fish and ordered Grilled Spanish Mackerel, which came with crispy skin and sitting on a raft of asparagus that floated on a sea of pureed fennel. Virtue was its own reward and I will definitely put mackerel on my list of fish I enjoy, but the sauce of champagne sabayon didn’t hurt either. We concluded our meals with carrot cake whoopee pies (my roommate), a napoleon of chocolate and peanut butter (me), and espressos (both of us). I am already plotting what occasion I can use as an excuse to return, and hoping that the pickled cranberries are still on the menu when I do. Vindaloo is a dish that perfectly encapsulates Goa’s colonial history in one pot. It’s based on a Portuguese stew called ‘Carne de Vinha d’Alhos’ which is a slow braise of pork with garlic and red wine. Portuguese sailors arriving in Goa wouldn’t have wine to make the stew, but did have vinegar (which probably started out as wine in Portugal several months earlier). Hot chilis were added to the mix in response to local tastes. Pork and beef became the traditional meats used for vindaloos because Goa was a Christian enclave, and therefore didn’t have the religious proscriptions on pork (Muslims) or beef (Hindus) that prevailed in the rest of India. A lot of Indian restaurants add potatoes to vindaloo, both to stretch the dish, but also because the Hindi word for potato is aloo, and many people think that potatoes are therefore a traditional component of the dish. However, the name vindaloo is a corruption of the Portguese vinha d’alhos, and while potatoes are certainly something you can add, they aren’t actually traditional to the dish. Seed the dry chilis and break up into pieces (or don’t seed them if you like things really spicy). Soak the chilis, with the garlic cloves and ginger in the white wine vinegar for 30 minutes. Blend to make a paste. Marinate the chicken in the chili paste for at least 1 hour. In a spice grinder combine the cloves, cumin seeds, whole cardamom pods, and peppercorns. Grind to a powder. Mix with the turmeric and cinnamon. Reserve. Heat the oil in a large heavy pot and add the mustard seeds. 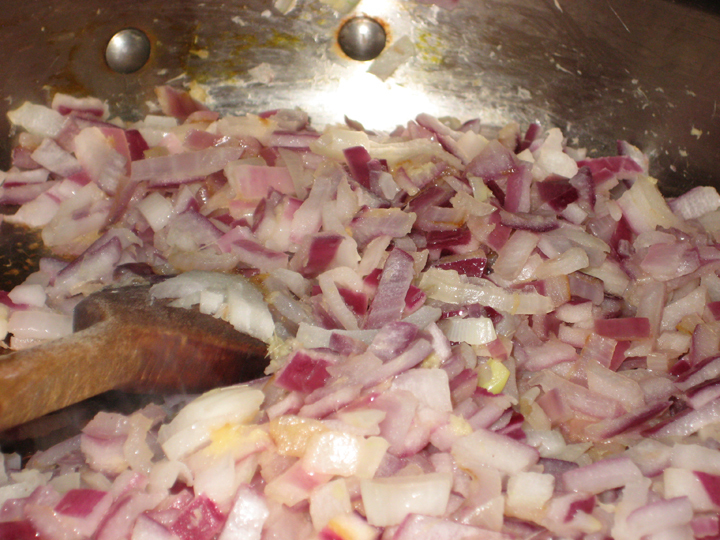 When they start to pop add the onions and fry until the onions soften and start to turn a light golden brown. Add the marinated chicken with the marinade and stir fry for a few minutes, or until the chicken just starts to pick up some color. Add the dry spice mix and some salt and stir to coat everything evenly. 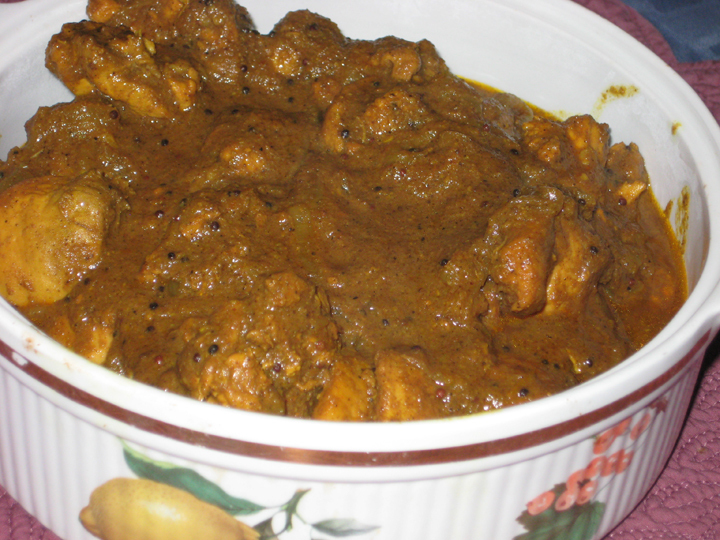 Cover the pan and let the mixture simmer until the chicken is done and the curry is thick – about 30-40 minutes. 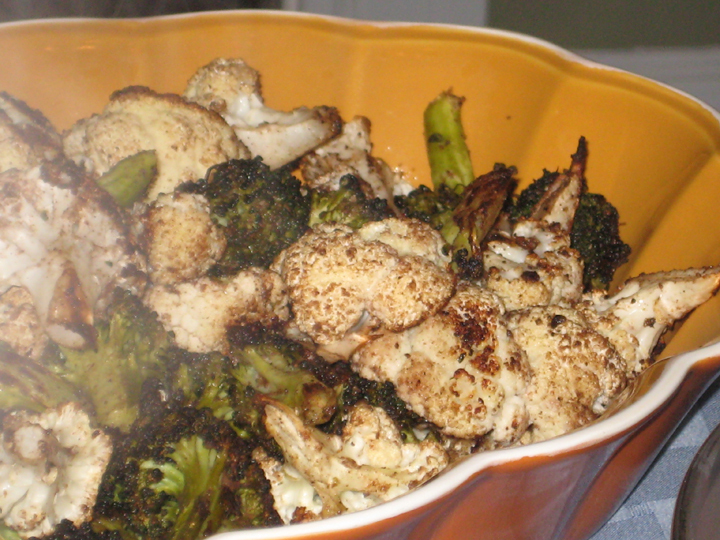 Season to taste with salt, pepper, and honey. 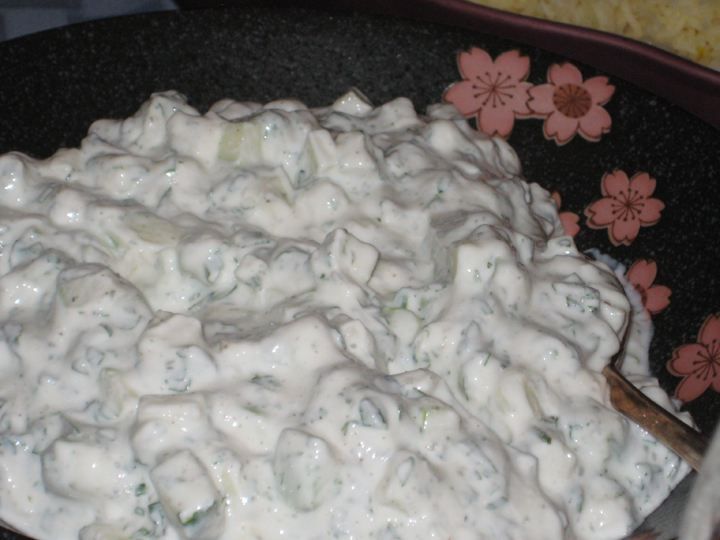 Serve with rice and raita. You can make this a day in advance. This is a recipe that’s been kicking around my ‘to make’ list for nearly a year. In the end it was fine, but not necessarily something I’d go out of my way to make again. Saute onion and ginger in oil for about 4 minutes. Add tomato paste and cumin seeds, cook for about 1 minute. Add tomato, chili, garam masala, turmeric and salt, cook for about 2 minutes. 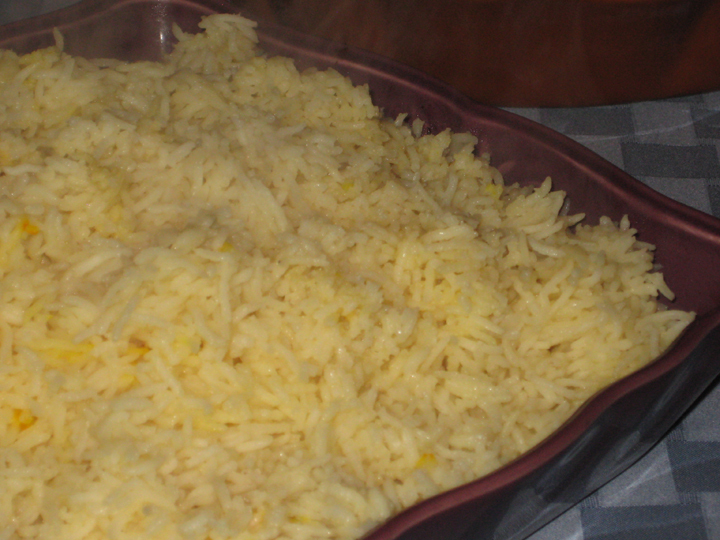 Add the water, pureed mango and eggplant and stir to combine. 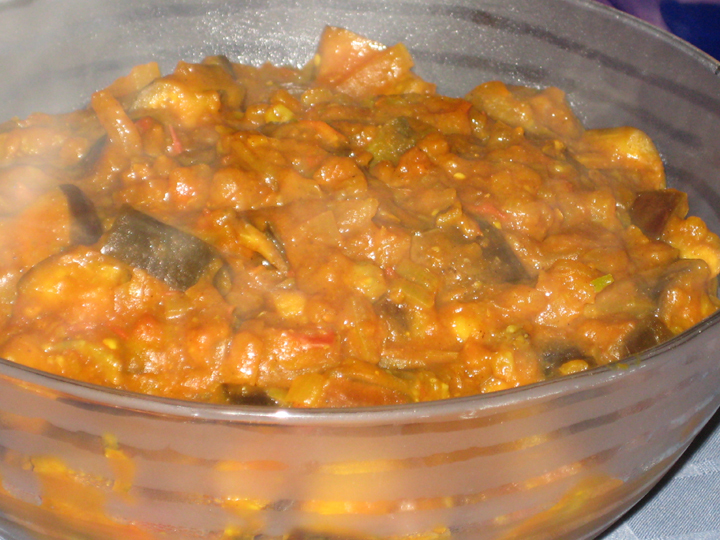 Cook at a simmer for about 15-20 minutes, stirring occasionally, until the eggplant is tender. Season to taste with salt, pepper, and honey. Mix all together. Season to taste with salt/pepper.